There are some real advantages to having these under your wings. Michelin AIR X radials typically weigh 20–30% less than comparable bias tires, and they operate at cooler temperatures. Helps provide measurable fuel savings, more landings per tread, longer wear characteristics and a more stable contact patch than bias tires, as well as shorter turnaround times and reduced carcass fatigue. 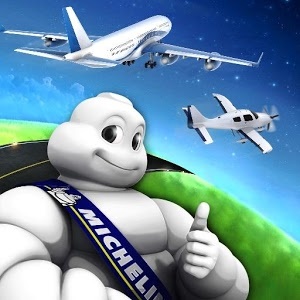 Michelin’s carcass design helps restrict tire growth and the stretching of rubber. Results in better cut resistance than bias tires. Durable cut-resistant tread includes deep skid depth and specially-designed circumferential grooves. Helps provide for an extended tire life, less heat build up and lower maintenance costs due to fewer tire changes. Sidewall is optimized for both ozone and ultraviolet light protection which helps reduce ozone cracking in key areas of the tire. Provides our maximum amount of exterior wear and crack resistance for a long tire life. 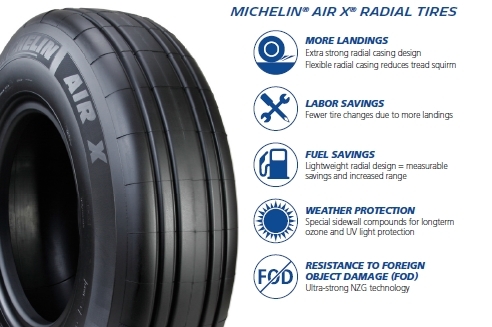 The Michelin ® AIR X ® casing is more fl exible than casings used in bias tires. Results in noticeably smooth operating characteristics during taxiing, landing and takeoffs.